I’ve introduced dogs to different rabbits a few times now and luckily it has always gone well. However, the first 3 dogs were collies or collie crosses. Theo has been the first terrier I’ve tried this with. But as a friend said to me…staffies are terriers with a small ‘t’ unlike other terriers which have a high chase and kill instinct. 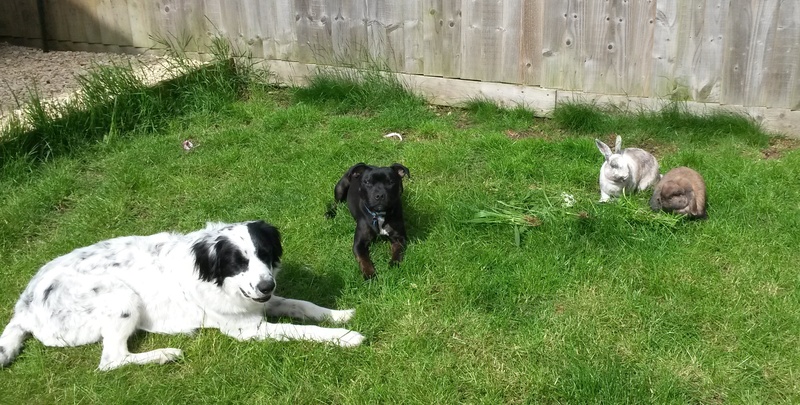 Breed and individual temperament is crucial when looking for a dog to live with rabbits. There are always exceptions to the rule but generally sight hounds (greyhounds etc. ), spaniels and terriers don’t make the best companions for rabbits and other small furries. 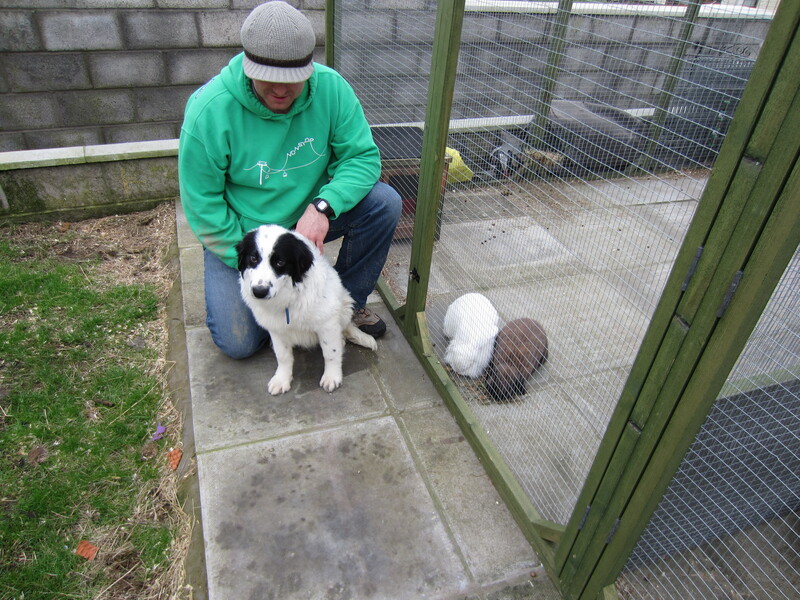 I was prepared to try with Theo and was fairly confident as he was so young when we got him and because I know a few staffie owners that also have rabbits and guinea pigs. Stage 1. With the rabbits in their run we let Theo out into the garden. He was initially very excited and ran around the run barking. My rabbits are used to dogs and therefore ignored him and did not run away. To stop him barking and chasing them I fed them so they stayed in one place and I scattered food for Theo around the outside of the run so that he could associate the rabbits with yummy treats (and they associated him with yummy food too). After a few days he got bored with them and ignored them completely when he went into the garden. Yogi at Stage 1. Meeting the rabbits safely through the run. The rabbits have been rewarded with tasty food to encourage a positive association with the dog for them. Stage 2. With Theo, stage 2 lasted about 7 weeks and will depend totally on each individual dog. With our other dog Yogi this stage never even happened as he has no chase instinct at all. With Theo this stage involved the rabbits being free range in the garden (they get a lot of free range time every day) with Theo on the lead. Every time Theo needed the toilet we took him out on the lead. That way, the rabbits could run around him and he could get used to them without chasing. If he showed interest in chasing them we gave him the command ‘leave it’ and as soon as he turned his head towards us he was rewarded. (We used clicker training so that we were more precise with his training and the ‘leave it’ command). He was also rewarded for ‘good’ interactions such as sniffing them gently (or them sniffing him) or ignoring them when they hopped passed him. Stage 3. This stage occurred simultaneously with stage 2. We took Theo to puppy training classes and learnt how to teach him ‘leave it’. This was practiced every day asking him to either leave a tasty treat or even to leave the cat! Stage 4. After weeks of being in the garden on the lead, Theo was allowed off to roam around the garden free with the rabbits. We always go outside with him and initially I always took treats so that if I needed him to come back he would get rewarded. Now we are in May (we got him in January) he can go out to the garden with the rabbits and although he is always supervised by us, we don’t need treats all the time to get him to come back. He is now more interested in the rabbit food or rabbit poo to take notice of what they are doing and likewise they aren’t bothered by him. Hi! Lots and lots of treats and rewards are a good start. Your dog needs to know that the presence of rabbits and being calm around them (doing activities like sit, down, paw) means lots of good yummy things happen. It took about 3 months for us to be able to let Theo free range with the bunnies. We did everything by their run or with him on a lead to start with. Good luck!